Last week I got a notice in the mail announcing that my kids’ school lunch price would be increasing by about 10 percent this year to $2.25. Despite the increase, I’m sure many busy parents struggling to make ends meet think that’s still a bargain for lunch. It’s not. In fact, with the new school year quickly approaching, one of the easiest ways to save money is to bypass the school cafeteria fare and make your kids’ a brown bag lunch at home. Whether it’s for school or the office, brown-bagging a sandwich, piece of fruit, and carrot sticks or a serving of chips will almost always be less expensive than buying lunch somewhere else. Thankfully, the results of my fourth annual brown bag sandwich price survey show that most folks will end up spending far less than that in 2012 — even for the most expensive sandwich on the list. 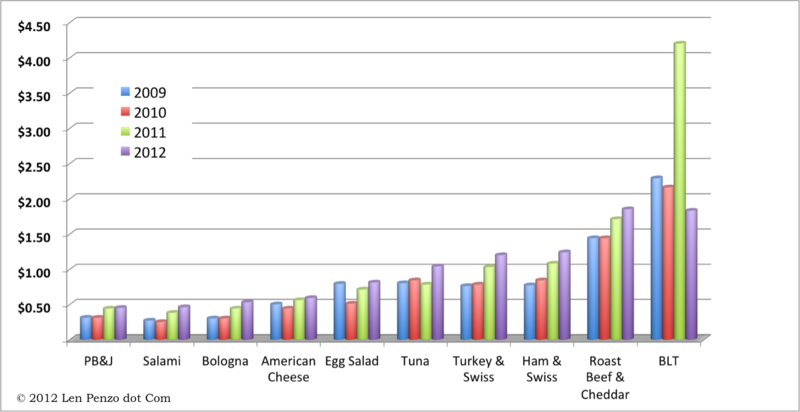 As I have every year since conducting my first sandwich survey in 2009, I moseyed on down to my local grocery store and recorded the per-serving costs of various ingredients for ten of the most common brown bag sandwiches: peanut butter & jelly; bologna; tuna; ham & Swiss; roast beef & cheddar; egg salad; salami; American cheese; turkey; and bacon, lettuce & tomato. 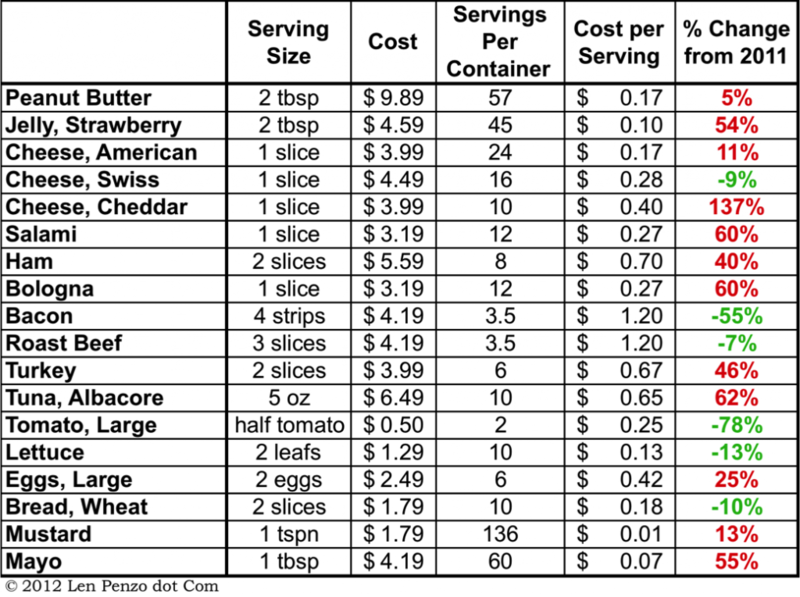 As in my past sandwich surveys, for consistency in determining prices of the individual sandwich ingredients, I only selected items with the cheapest per unit costs, regardless of brand. To keep it simple, I also assumed all sandwiches would be made with wheat bread. The next chart shows a year-by-year comparison for each sandwich since my first survey in 2009. If you’re like me and love to put tomatoes on a sandwich, grow your own — you’ll save a bundle. Best of all, they taste much better than anything you can buy from your grocer. For the first time, peanut butter & jelly holds the honor of being the most economical sandwich in the survey, finally knocking the perennial-champion, salami, off the top spot. The signs of inflation that began to appear in 2011 have clearly accelerated, and many of the latest increases are rather disturbing. For instance, ham, salami, bologna, turkey, tuna, mayonnaise, and jelly prices all increased by 40 percent or more since the last survey — and the price of Cheddar cheese increased an incredible 137 percent! With that in mind, it should be no surprise that prices for nine of the ten surveyed sandwiches saw increases this year. Somewhat ironically, last year’s most expensive sandwich, the BLT, was the only sandwich in the survey to see an overall price decline this year, thanks to significant drops in the price of tomatoes and bacon. 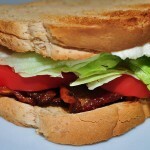 In fact, the BLT is the only sandwich in the survey that is less expensive today than it was in 2009. Last month the large spike in bologna prices temporarily made that popular lunch meat more expensive than lobster, thanks to a glut of the tasty crustacean. 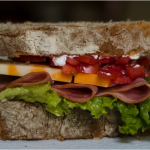 But don’t let that scare you; a bologna sandwich is still one of the most economical sandwiches on the lunch menu. Of course, that assumes you’re making the sandwiches — not Martin Blunos. Good. I guess I haven’t been crazy! My grocery bill has been steadily increasing for more than a year but I was beginning to wonder seeing that I keep hearing reports on the news that inflation is tame! Our bill has gone up too, Cindy — and that’s despite some manufacturer’s trying to keep prices down by reducing the package sizes. Inflation is really here and it’s here big time. By the way, I have been carefully tracking every item I purchase at Costco since December 2011, and I plan on reporting on how inflation has affected those costs later on this year. So stay tuned! I knew brown bagging it was cheap, but I had no idea just HOW cheap until now. Great job, this survery must have taken you awhile. I work a night shift and so sometimes I just throw together a sandwich on my way out and thats my “dinner”. It definitely helps save money around the house. 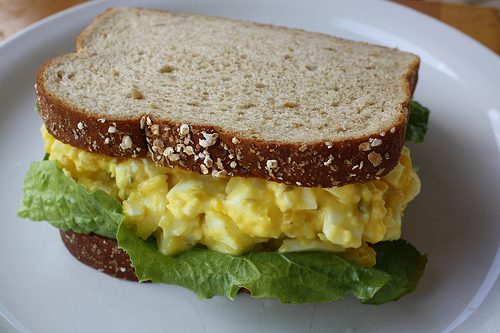 Talk about throwing together a sandwich … You should see the ones I make for work, Lauren. More often than not, it’s two slices of bread, a slice or two of lunch meat and I’m done. No condiments, no lettuce, no tomato. I take PB&Js to lunch at work almost daily. I don’t know what it is but I generally prefer them to lunch meat. Call me weird it is OK! I love PB&J too, Lance. Especially with a big glass of cold milk. I’m eating a fried eggplant sandwich from home leftovers as I read this. Very economical, and tastier than most lunches you can buy. I almost never go out for lunch. I can make it better! I hope you have that on some fresh bread from the Italian bakery, Joe! Speaking of great Italian sandwiches, now I’m in the mood for a meatball sandwich. That’s an in-depth survey. Brown bagggin is always cheaper. But I know we are sometimes lazy, I get that way, and will need to buy my food. And a good catch on inflation…it has appeared among our daily goods and services. 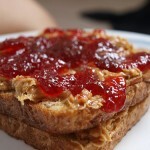 I often keep jars of PB and jelly at work, and bring a couple slices of bread so as to make a fresh PB&J at lunchtime. There’s something comforting about my favorite childhood sandwich, and I don’t think I’ll ever get tired of it. I will admit though, Skippy and Smuckers have been replaced with Trader Joe’s organic/no-sugar-added varieties. I was really shocked how much the price of jelly skyrocketed this year. Even so, it’s nice to know that despite the large price increases the price of a sandwich made at home is still a relative bargain. I am curious, Len. The salami and bologna sandwiches are near the top but each of them only has one slice of meat. Why is that, when ham and turkey have two slices and roast beef has three? I have to admit I never make a sandwich with just one slice of luncheon meat. Great question, Sassy! Those serving sizes were based upon the defined serving sizes on the packages. I suspect the salami and bologna serving sizes are one slice because they tend to be thicker than ham, turkey and roast beef slices. Since my children started schooling, they never bought food from the school cafeteria. Not only it is good for our budget, I am also assured that they are eating healthy. Even when I was working in the corporate world, I make my own lunch and snack and bring them at the office. Now that I stay at home with my kids, I prepare sandwich and slices of fruits for their lunch and snack in school. My wife, kids and I always brown bag it to save money and eat healthier. We would never let our kids eat school food. I do not recommend it. I should know, I’m a teacher. Love sandwiches! Thanks for the delicious tips and information.